Everybody needs a “go bag.” Let me explain exactly what that is. 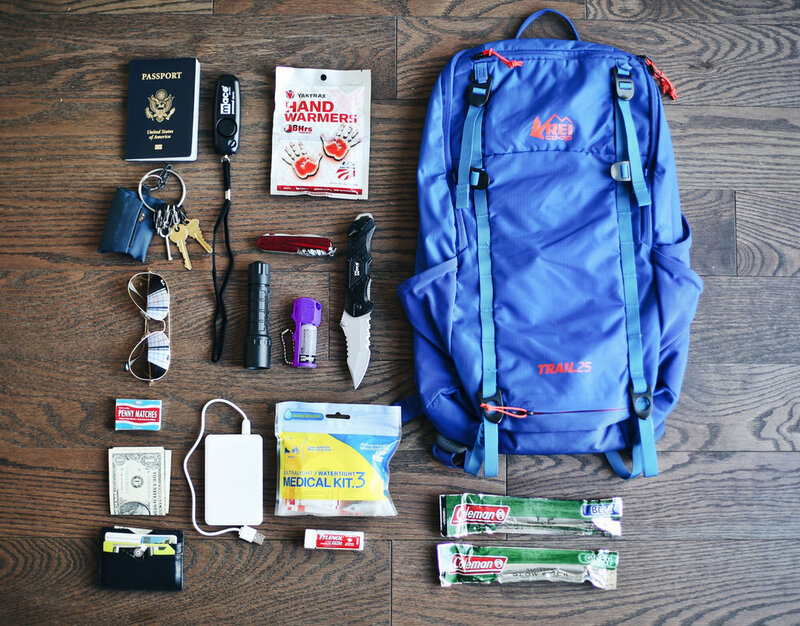 A “go bag” is something you should have ready for emergency situations. It should contain things that you or your family need on a daily basis to not only survive but also function. This way, if you need to leave your home immediately, you have all of your essentials in one location – think Hurricane Harvey or the California wildfires. During stressful situations, it is not the time to be looking for your passport or your extra cell phone charger. Here are a few of the items that I keep in mine, but make sure to customize your “go-bag” to your own specific needs. For example, think about any medications a child may need or something as simple as an extra pair of eyeglasses. Also, consider adding dry snacks and a few bottles of water in case you find yourself without access to food. Passport – It’s the main accepted ID, not only in the US but throughout the world. Mace Brand personal alarm – It’s a great way to draw attention to yourself – in case you're physically attacked or ever lost. Hand warmers – I’ve been using hand warmers for years because I spend a lot time working outside. When you’re in the cold your extremities are the first to feel the effects. Keys – It’s always a good idea to have an extra set. CPR facemask – I keep this in case I need to give assistance or help another person in need. Emergency situations, don’t just affect you they affect everyone around you. Utility tool – They really come in handy. It’s like having a toolbox in the palm of your hand. Sunglasses – Not only do they shield you from the sun but they offer great eye protection as well. Flashlight – This is super important. If the power goes out or you’re out at night, you have the ability to see without needing to rely on anything else. Mace Brand pepper spray – Even in emergency situations you should never let your guard down. It’s an extra layer of keeping yourself safe. Knife – It’s another great utility tool. You can use it to cut through rope, tape, or even a seatbelt strap. Matches / lighter – You might find yourself in need to stay warm, cook food or light candles. Cash – Cash is king! Especially the US dollar. It can get you out of any situation in almost every part of the world. Portable cell phone charger – We’ve become so reliant on our phones in terms of communication or GPS. Having a dead cell phone may severely limit your ability to call for help and remain aware of what is going on around you. First aid kit – A definite must. You may find yourself in a situation where you don’t have access to medical care. Credit cards – Having a back-up to cash is important in case you run out. Pain reliever / aspirin – It’s better to have and not need, than to need and not have. Glow sticks – It’s a way to make yourself seen in the dark and they can last for a long time. I keep these in my car too. Go bag – It’s not a fashion show. Pick something that is durable with extra compartments.